I’m an architect that has always wanted to be a carpenter, or a builder, or a boiler maker, or something else other than that so I could use my hands and make things. I live in the bush in south New South Wales with my wife and our dog and our cows and our landscape and our weather. Does living on a farm help your creative process? It almost is my creative process…you cant help but be inspired by the need to be real with whatever you do, to be direct with your decisions, and committed…thats living in the bush. At first I was surprised to hear that you were an architect by trade but then it kind of made sense. Do you design bikes like you design houses? I think I design anything the same. I prioritise a set of issues/elements/parts/whatever according to function or form and then make subsequent decisions based on the combination of those according to the program/or brief/or whatever. Do you do a sketch before you build your bikes? No, I hate to draw because I can draw well and when I do I feel I post-rationalise the design way too much… in other words… I start changing the design based on criteria not directly connected with the task at hand and that is not acceptable in any way for me…. so… in all design now, I will only draw something if its absolutely necessary, and I will send it away for build without looking over it, of course I cant do that with things that I am building so better not to sketch, better to feel and work by sight. I know you’re a big Harley and Norton fan, and recently we’ve seen your European side. Can we expect a Japanese bike soon? 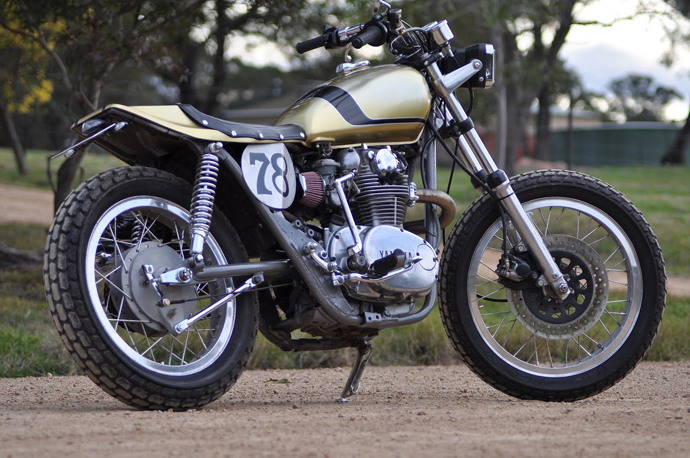 I did an XS 650 recently (pictured below), that was fun,…. but I think the next year will be full of American and British stuff……..but maybe one Jap single will come…. 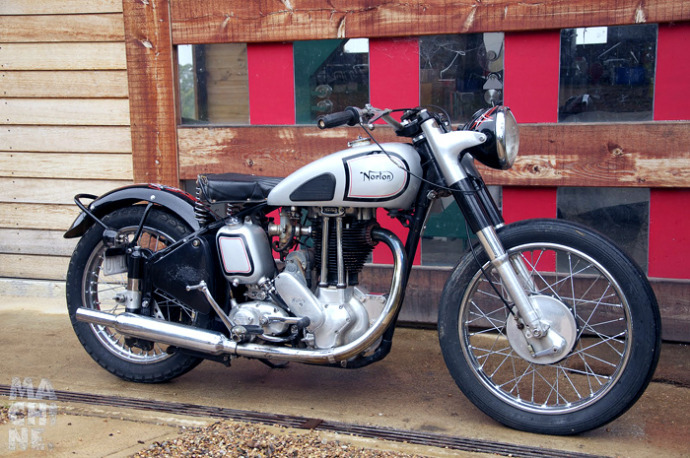 Your favourite bike of all time is the Norton50 es2? What is it about the es2 you love so much? Well, its that it was my first real bike that I had to learn and really learn to love. 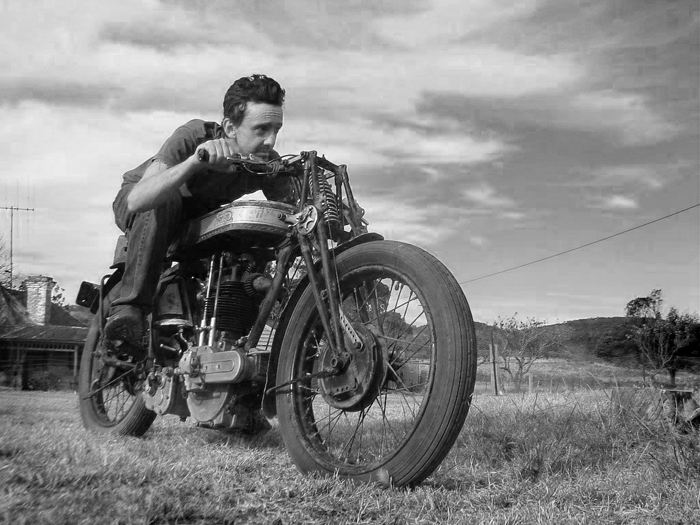 when you ride a bike everyday for years and years (an old one I mean) (not one you take in for service every 1500kms, but one you have to look after yourself and love) you can’t help but become connected to that piece of machinery in some soul stirring way. down deep…..I’m almost feeling it now with my 48 pan….its just about miles and miles and falls and breaks and everything that goes with riding in that way. 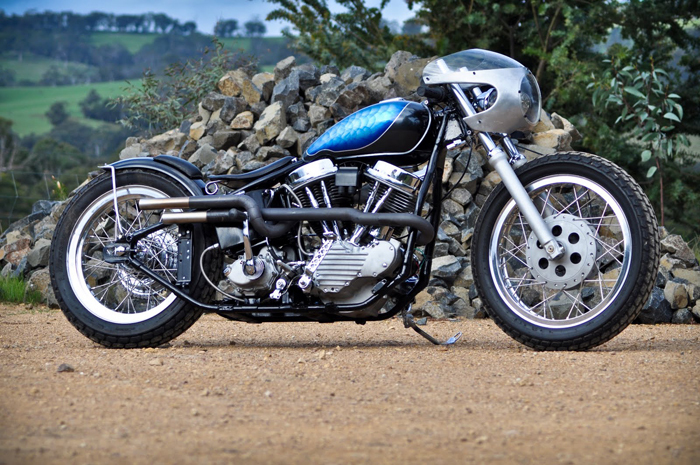 Your 50 Panhead is one of the sweetest bikes we’ve seen this year. How many hours went into that build? Was it hard to let go? Well no, cause it was never mine….it was built for one of my best mates Joe….its a very well resolved design I think, even though its undergoing a few little tweaks and changes as we speak. nothing major, just rider comfort stuff. it took about 350 hours to build it. Do you hand make your fairings? …no, I get the blanks and then I remodel them and change their shape to suit the bike…I hand beat the 50 pan fairing and totally changed its shape, then I recut and welded to make it shorter and then repolished it. 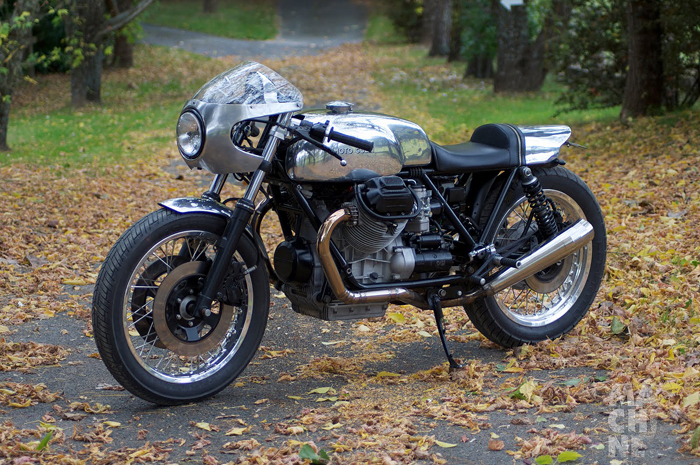 Your Guzzi Le Mans was the standout bike (in my humble opinion) at the Deus V-Twin festival. Every detail looks so well thought out and made to such precision. What’s your favourite part of the bike? 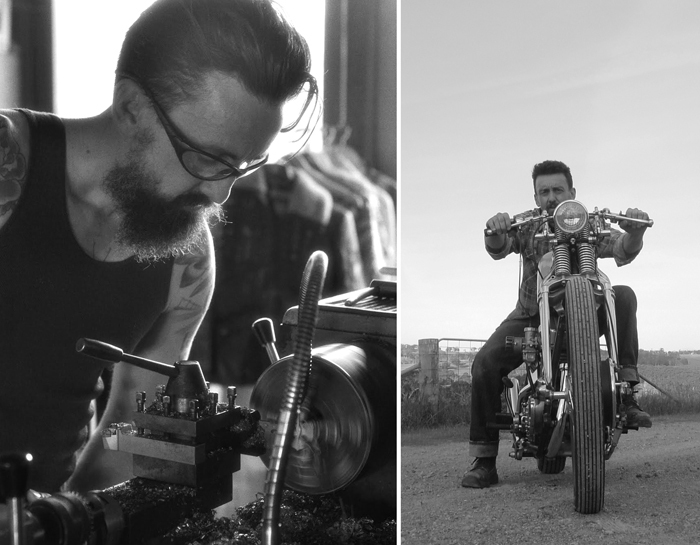 My favourite part of the bike is the bodywork…it was a big thing for me to really get stuck into the alloy work on that bike, to cut up a tank and rework it, and make that tail section from scratch was a big hurdle that I had to push myself to do. im better for it and I know the way forward for MACHINE, and its in alloy. 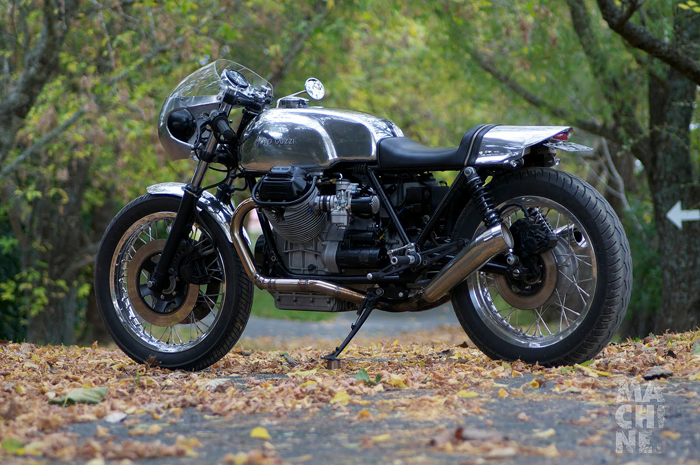 The Guzzi Le Mans won best European at the Deus V-Twin Festival. Having a glass of red wine and eating a slow cooked lamb shoulder for dinner with poached quince and ice cream for dessert while sitting outside and watching the fire with my girl and the dog. Last question. You have $5000 dollars to spend on a bike in Australia. What do you buy and why? I would buy a mid 90’s 1200 sportster that was registered or just out of rego that I could rework with about a thousand bucks. why?…ride one across australia and then ill tell you why….but that was just in the 5k category ok? !